Retail footfall grew in March according to new figures from the British Retail Consortium, boosted by weather events that negatively impacted shopper turnout last year. Save not spend remains the message from British consumers polled for GfK's monthly Consumer Confidence Index in March with fewer people believing now is the right time to splash out on high value items. Carpet price inflation narrowed in February. Easing input cost pressures helped furniture and flooring price inflation at the factory gate narrow in February, according to new Office for National Statistics data. Upholstery was the weakest category in February. Retailers suffered weaker sales in February with all four of the main categories — upholstery, cabinets, beds and carpets — seeing year-over-year declines. Consumer price inflation for furniture items advanced to its highest level since the spring of 2018 last month according to new figures from the Office for National Statistics. Sales were up 2.2 percent in January, said the British Retail Consortium. Retailers enjoyed sales growth in January after flat sales the month before according to new figures out overnight from the British Retail Consortium (BRC). Consumer confidence was unchanged in January as fears over the economy were countered by improving sentiment regarding personal finances. 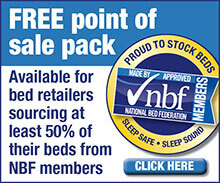 Mattress and bed retailers ended 2018 on a high as the value of sales in December topped £200 million for the first time, a record high for a single month. Furniture retailers discounted at deeper levels in December according to new official data but price pressures further down the supply chain threaten to push costs up. Retailers saw fewer shoppers on Boxing Day for the third consecutive year but the total number still beat forecasts, according to retail analysts Springboard. Boxing Day, one of if not the most important shopping days of the year for big-ticket furniture chains, will see reduced footfall next week putting greater emphasis on sales craft if retailers are to secure orders. Furniture retail price inflation returned in November after being negative or flat over the six months immediately prior, calming fears heavy discounting was needed to stimulate sales. The value of retail sales lifted mid single-digits in October according to the Office for National Statistics (ONS), though furniture and lighting sales were fractionally lower year-on-year. Retail footfall fell in October but edge and out-of-town shopping parks — where many of Britain's residual furniture and flooring stores are sited — near maintained year-earlier levels. Consumer confidence declined last month with shoppers less enthusiastic about splashing out on high value items such as furniture and cars, according to new figures from GfK. Retail sales climbed mid-single digits year-on-year in September according to official data from the Office for National Statistics. Consumer furniture prices fell for the fourth month in five in the year to September and at their steepest rate since the autumn of 2016 as retailers defied rising product costs. BRC-Springboard Footfall and Vacancies Monitor figures for October. Retail sales inched forward last month according to the British Retail Consortium, but at the slowest rate in five months. Consumer propensity to purchase high-value items such as furniture and white goods maintained its level in September, according to GfK's long-running monthly survey. Consumers are ready to splash out on big-ticket bulky goods such as furniture after a big improvement in sentiment between July and August, according to new consumer confidence data. Furniture sales fell mid-single digits in July as one of the longest and hottest summers on record continued to take its toll on retailers across the length and breadth of the UK. Consumers enjoyed keener prices as furniture deflation narrowed to its shallowest level in nearly two years last month. England's run to the World Cup semi-finals was good for morale, but not for consumer furniture spending as a second retail monitor found big-ticket goods sales to have been lower than this time last year. July retail sales advanced thanks to higher food and drink sales as Brits enjoyed the weather and World Cup. Non-food categories wilted in the heat. Sales declines swept the board across all big-ticket furniture categories in June, leaving only beds and mattresses ahead on an annual basis in the year so far. Mattress prices at the factory gate fell for a ninth straight month in June according to figures out yesterday from the Office for National Statistics. Retail parks, home to many of the UK's largest furniture and floorcoverings retailers, near maintained footfall last month. Retail sales went with the form book in June as the World Cup and sunshine boosted food, drink and TV sales but left furniture retailers cold. Consumer confidence slipped in June with the measure taking in big-ticket furniture spend intentions falling for a second straight month. Year-on-year furniture sales were down more than £14 million in May as upholstery and case goods underperformed. Furniture prices slipped below year earlier levels for the first time in more than 18 months in a sign that retailers discounted deeper to secure sales last month. The decline in footfall across Britain's retail destinations eased in May thanks to improved out-of-town shopper numbers and the evening economy.